The IMDB app for iOS and its corresponding Android version have added the ability to purchase tickets for movies as long as you’re a user in the U.S. 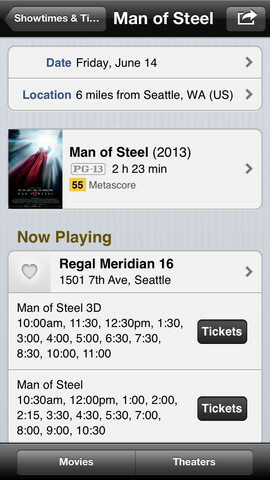 This follows other movie apps like Fandango and Apple’s Siri in offering this ability. You can now also tap on a ‘buy’ link in the iPhone or iPad app that sends you out to the Amazon Mobile app with a search for the movie you’re looking at. Obviously, you have to have the other app installed, but that’s a nice featured. And not too surprising as Amazon owns IMDB. The iPhone app has also now added one tap access to the full cast and filmography lists, which now actually scroll like they should, which is fantastic. This has been an annoyance as it’s been tougher than it should to just see the info you want to see in the app. Still easier than the website though, and there is now extensive ‘watch list’ support for future movie viewing. IMDB is easily the largest database of movie-related information and, despite its growing amount of clutter and usability issues over the years, still remains the place most people go to find out ‘who was in that thing’. Adding movie ticket purchasing isn’t necessarily a first-party necessity as I’m not sure most people go to IMDB to plan their movie watching, but a couple of years ago they added movie trailers and forums so this seems like a natural extension of the mobile offering. What is nice about the IMDB app is that it manages to clear away a lot of the cruft that has gathered around the essential information related to a movie’s production. That info has managed to cluster around the central functions of IMDB over the last few years, making it less and less pleasant to use. The app is still very nice and a permanent resident of my movies folder.